Pharmacy is central to all care areas within a hospital setting and where significant investment in technology will be required over the coming years to assist pharmacy & hospitals continue to deliver their service safely and efficiently..
Tracking a prescription quickly highlights some of the challenges faced by pharmacy with their current technologies & manual processes..
A pilot running in AMNCH utilising mobile technology and redeploying pharmaceutical technicians to wards to ensure medicines are managed effectively including ordering and storage of medicines on the ward is yielding very impressive results. Reduction of orders to Pharmacy by about 10%, Monday to Friday and 25% at weekends. In addition a non-stock order requiring 20 items would typically take 2 hours to complete (Pharmacist and Technician time) can now be turned around in about 15 minutes. The resource gained is being redistributed to direct patient care . Modern technologies are Key.... Some hospitals like the Mater hospital in Dublin have over the years invested in technology to assist pharmacy. The Mater is the only state hospital utilising robotic dispensing technology , ordering available from anywhere in the hospital, good processes in place , almost paperless in the pharmacy and an example of how technology is assisting pharmacy within an Irish hospital. Chief pharmacists around the country have identified technologies that would revolutionise pharmacy within Irish hospitals and are keen to be part of any National initiative that would progress this agenda..
Utilising automation and intelligent systems will improve the entire medication administration process from the way medications can be prescribed, dispensed, to how medicine is given to patients e..g.
ePrescribing to allow medical personnel to generate an electronic prescription anywhere within the hospital. 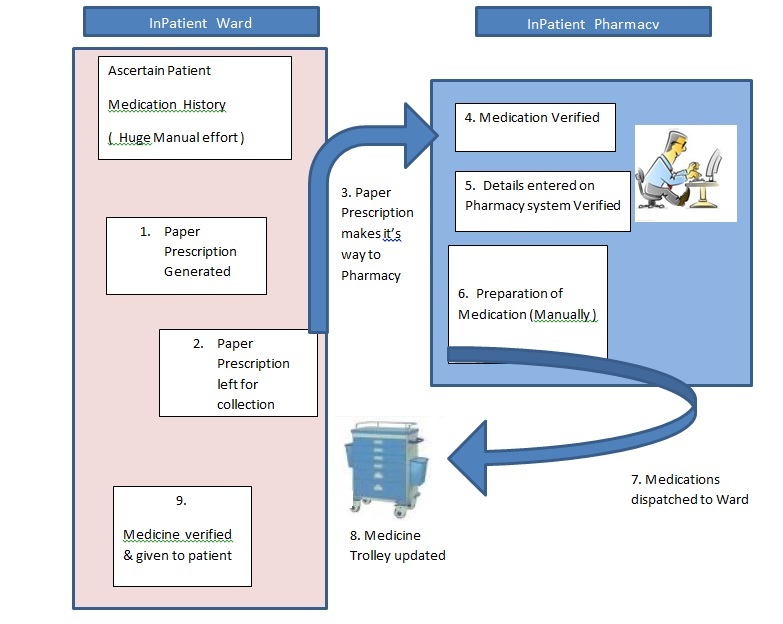 The introduction of robotic dispensing technology into the pharmacy to assist medicine preparation. In the Public Sector here in Ireland there has been relatively low investment in robotic dispensing technology to date . The exception is in the Mater Hospital in Dublin whose investment in a robotic dispensing system has been a huge success ,central to their workflow and a working example in a public hospital within Irish Healthcare . Robotic dispensing technology in Pharmacy is well tested and utilised in hospitals and community pharmacies around the world and the technology has been adopted by a number of pharmacies across Ireland e.g.